I received a really interesting email this morning from my high school alumni association. 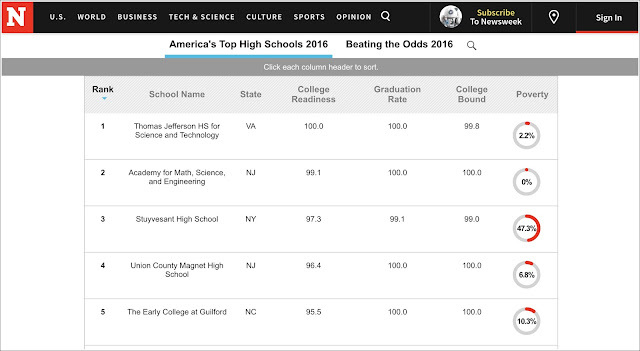 It included a link to Newsweek's "America's Top High School 2016" rankings. My high school, Stuyvesant, a New York City public school where entry in freshman and sophomore year are exam- and merit-based, ranks number three. What I thought was especially interesting is that the data also shows that Stuyvesant has the highest percentage of students living at or below poverty level—47.3 percent!—of any schools in the top-ten. There's been a lot of chatter from the Mayor's office and the New York City Board of Education over the past few years about doing away with the entry exam for Stuyvesant and hinging admission on junior high school academic records, with an eye towards cultivating a more racially diverse student body. I don't know what the correct solution is here—because I do believe that diversity is one of the most important facets of an educational environment. But it's clear that Stuyvesant, with nearly half of its student population living in poverty yet still excelling in national school league tables, is doing something right. In a way, the school is the embodiment of a stepping stone on your way to the American dream: it doesn't matter who you are or where you come from, if you can compete, if you work hard, if you show up, you'll make it. When I was a student at Stuy in the early-90s, I knew lots of kids who grew up without money—some kids I knew lived in rooms in the backs of restaurants with their entire families, some kids I knew were living out of the shelter system, bringing all their stuff with them to and from school everyday. Most of these kids grew up to become doctors, lawyers, bankers, scientists, and business-owners (I know because of Facebook). That's why I don't think that keeping kids out of Stuyvesant because they don't match a specific racial profile is the correct solution. It's not fair to deprive a student of an opportunity to succeed when they're motivated, eager, and hard-working. The only way to raise the bar of education in this city is to ACTUALLY RAISE THE BAR all across the board, in every single school in the five boroughs. It doesn't make sense to overhaul something that has a 100+ year history of success and over-performance—tall poppy syndrome should have no place in formulating our city's education policies. Foundational public education—from kindergarten through twelfth grade—as well as parental and community outreach, giving families access to information about opportunities available to their children, needs to drastically improve from the ground up. The magic of being a student at Stuyvesant is that, for four years, you're immersed in an intense, vibrant, thought-provoking, achievement-oriented culture. It works. Why tamp down on that? Instead, the city could find a way to encourage a culture of learning, intellectual curiosity, and the rewards of academic achievement in all its public schools.